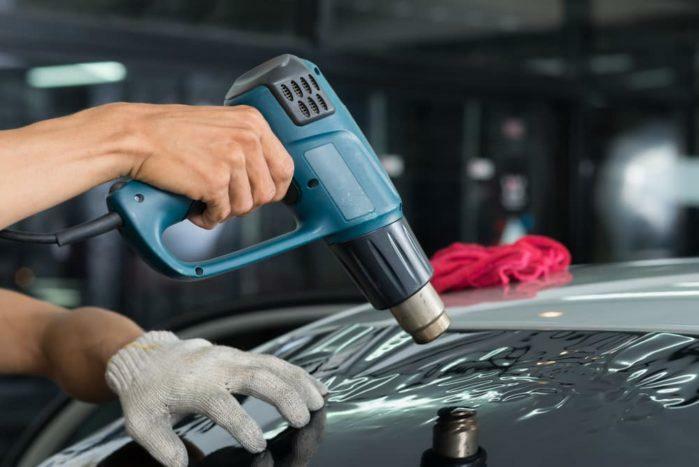 A heat gun can serve a lot of different purposes than just drying out things. If you find the best heat guns for you and your projects, you would see how convenient working can get. However, there are some things you need to know first before buying. That is why today, we will be featuring a simple buying guide to buying the best heat gun. We included some things you should consider first before buying as well as several reviews on products that we think you might want to try. Although a heat gun might work similar to a hair or blow dryer, its temperature is significantly higher. Different types of a heat gun that serve for different purposes have varying temperature ranges and airflow. A standard heat gun usually ranges from 100 to 550-degree Celsius. However, some heat guns come in higher temperature ranges up to 760-degree Celsius. A significant part of a heat gun is its nozzle. Shrinking films, tubing, wrap packaging, etc. Although there are still some other uses we might not have mentioned yet, these are just some. So if you didn’t see the nature of your project among its listed uses, do not be afraid to research some more if it is suitable for using a heat gun. It is a critical aspect, especially if you will be using your heat gun regularly, for a long time. And most especially because, when using a heat gun, you will be dealing with extremely high temperatures. It can potentially burn or scald you, leaving permanent injuries. Among any other tools or equipment, they should have safety features. Safety features help keep you from experiencing any dangerous accidents so be sure to pay them attention. Does it come with a stand or hook for after use? Is the temperature settings highly functional? Is the switch strategically placed for emergencies? Can it shut down automatically after reaching a certain level of temperature to avoid overheating? Determining which type of heat gun is best suited for the nature of your project can help increase its efficiency. There are four main types of heat gun: infrared heat guns, industrial heat guns, electric hot air heat guns and the gas powered heat guns. An infrared heat gun makes use of infrared heat as opposed to other types that use hot air instead. 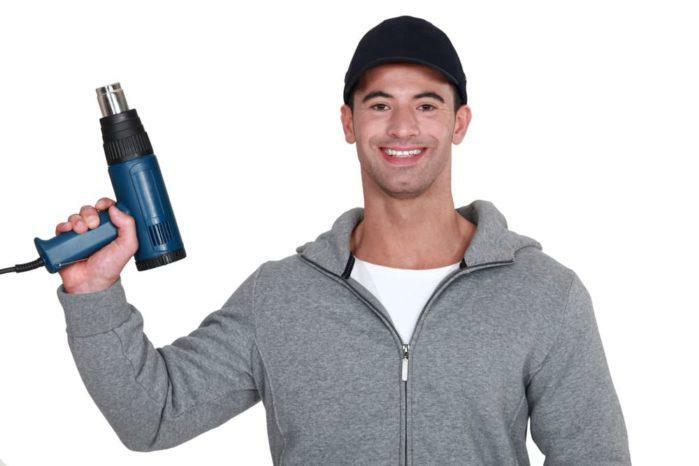 That also makes it very ideal for those who want to keep it safe and not inhale any toxic fumes. Also, they can also be significantly cheaper than other types of a heat gun. However, they might be less versatile due to their low-temperature range which is usually just between 204 to 315 degree Celsius. On the other hand, industrial heat guns can be electrically or gas powered. Industrial heat guns are more heavy duty, powerful, expensive and larger than other types. Gas powered ones make use of butane cartridges, fuel cells or tanks plus an electric ignition. Moreover, some models that are more advanced have self-calibrating features as well as a wider range of temperature and microprocessors. As for the electric hot air heat gun, its temperature range is usually from 600 to 1200 degree Fahrenheit. That makes it a pretty versatile heat gun. 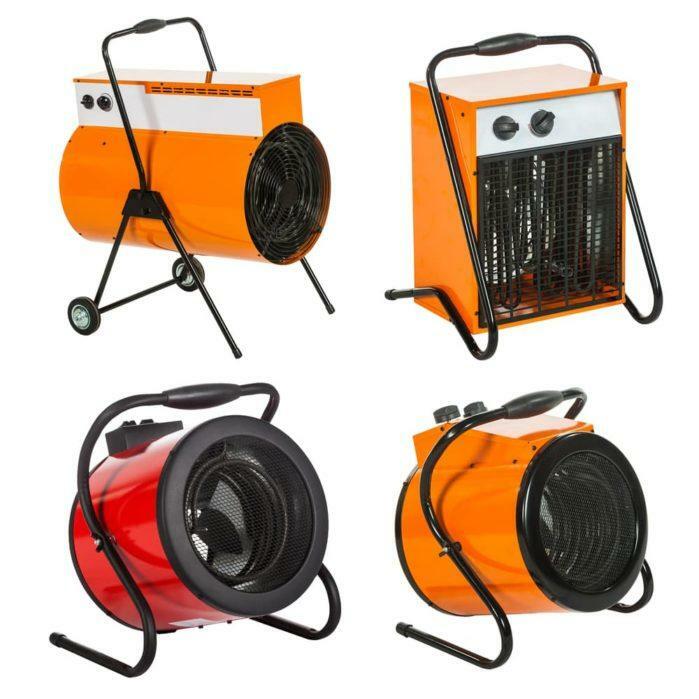 It comes in those small sizes which are perfect for home use and again, those larger ones that are for industrial work. 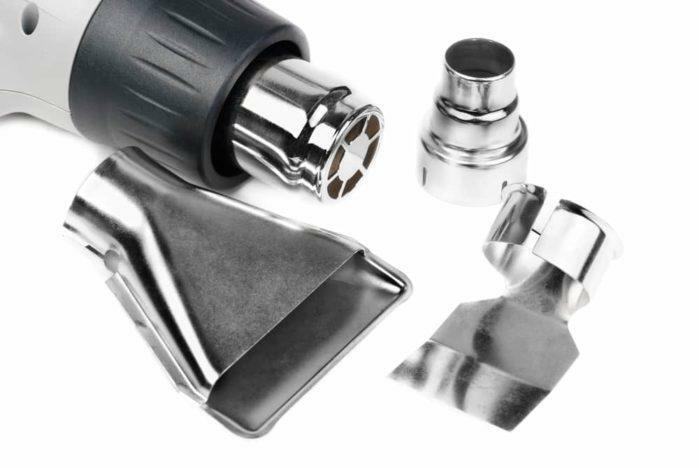 As for the types of a nozzle, five to six categories: the spoon reflector, built-in scraper, glass protector, cone, fishtail, and surface or flat nozzle. The spoon glass is ideal for soldering pipes as it reflects heat only around a small area. 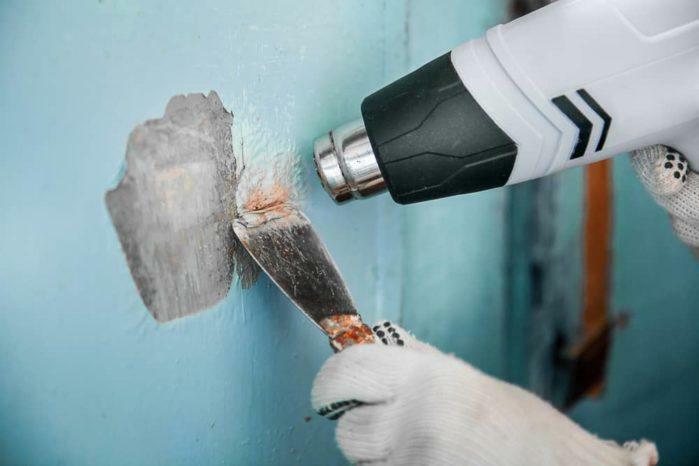 The built-in scraper is best suited for paint removal as it allows for one hand operations. Also ideal for paint (or adhesive) removal, the glass protector type can prevent window glasses from overheating. With the cone nozzle, its shape is perfect for concentrating heat on one area due to its reduced nozzle output size. Contrary to this, the fishtail nozzle can help you spread heat to a wider coverage area due to its “fishtail” structure. Lastly, the surface or the flat nozzle is mostly for covering or extending heat to precise measurements only. So be sure to identify the nature of your project carefully and choose the right type of nozzle for it. Read the manual carefully before using. Do not forget to buy protective gears and wear something that is apt for your work. It is important to have a fire extinguisher ready as well as goggles, respiratory mask, and some heat resistant gloves. These can hugely help make your work safer. After using the heat gun, use the stand or the hook and let it cool down first before touching it. Remember not to hit the nozzle. Also, it is best to work in properly ventilated areas to avoid inhaling too much of the toxic fumes, even if you have a respiratory mask. With Genesis’ Dual Temperature Heat Gun in Grey, you get a versatile equipment which features both high and low-temperature settings. There will be two temperatures in the heat gun itself: the 572 and the 1000 degrees Fahrenheit. You can even use it to light or heat up a charcoal grill, without the utilization of a lighter fluid which tends to smell unpleasant. Also, it also comes with an integrated stand and three nozzles: the deflector, reflector, and air reduction nozzle. It is very lightweight, making it perfect for extended time usages. The size and weight are very comfortable to hold. It can become scorching as it can heat up to 1000 degrees Fahrenheit if you need very high-temperature ranges. Its body has got a solid built that does not heat up when in use, making it quite safe. It comes with other nozzles aside from the main. It smokes up a bit on first use but gradually lessens as you use it further. The air movements it produces might not be as powerful. On the other hand, Porter Cable’s 1500-Watt Heat Gun comes in two packages. One that just includes the heat gun itself and another that comes with a grinder. It is also a 1500-watt equipment that features a dual fan speed selector and a variable temperature dial. Even better, it also features a six feet high-grade cord and a hands-free integrated support stand to make it more convenient to use. It comes with a pretty long cord adding to its convenience. It offers a versatile temperature range. The low fan speed can be set between 120 to 900 degrees while the high fan speed is between 130 to 1100 degrees Fahrenheit. It comes with a three-year limited warranty, a one-year free service and a 90-day money back guarantee. It can be a little heavy or bulky. You might that airflow is off or lacking. As for Wagner’s Furno 300 Heat Tool, it is ergonomically designed to be balanced and comfortable, thus helping reduce fatigue. It also has side bars which prevent the hot nozzle from touching your work surface. It can help lessen potential damages. The same nozzle is also corrosion resistant giving it a longer lifespan. It has six temperature increments and two fan speeds. And lastly, it comes with an integrated stand for hands-free operations as well as a hanging loop for cooling down before storage. The built is well-designed, and its rubberized handle is ideal for handling the heat. Its temperature is easily controllable even for beginners or first-time users. The settings available also makes it highly versatile or flexible. The cord is detachable making it very easy to store away. It might take up some time heating up. Black & Decker’s Dual Temperature Heat Gun also has two temperature settings: the 750 and the 100 degrees Fahrenheit. It is designed to be compact and lightweight, making it easily portable and comfortable to use. The built in stand also makes it easier for the equipment to cool down. But most importantly, it comes with a two-year warranty, to ensure your money’s worth. It comes with a two-year warranty, unlike other brands that offer none or limited ones. It very compact and lightweight making it ideal for users who plan to bring their heat guns to their project site. It heats up pretty fast. It only has two temperature settings. The cord might be a bit short if your workplace is a little far from the power outlet. Lastly, Dewalt’s Heavy Duty Heat Gun comes with an LCD which allows for adjusting the temperature in 50-degree increments. The built in hang ring also makes it easier to store and cool down. As for safety features, it has the overload protection which automatically shuts down the device to prevent overheating. Its cord protector also keeps it from being torn away from the housing and the built in kickstand provides stability and support when the heat gun is not in use. It comes with plenty of functional safety features. The LCD makes it easy for users to keep track of their temperature settings thus helping avoid accidents. It is very versatile and flexible with its temperature adjustment settings of 50-degree increments. It takes up some time to heat up or cool down. It can be a little pricey. The best heat gun for you will depend on the nature of your project/s as well as the frequency of your usages. However, if you want a very safe yet flexible (in temperature) heat gun, Dewalt’s might be a good option for you. Not only does it have a lot of safety features, but its LCD is also a handy addition to the features that can make using it a lot easier. Most importantly, though limited, comes with a three-year warranty. We wish you luck in finding the best heat gun for you!